Compact Portable Pressure Washers Provide High Pressure Water For Power Cleaning For Buildings, Vehicles, Concrete And More. 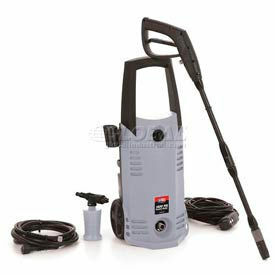 Compact Portable Pressure Washers are portable electric pressure washers that clean and remove mold, grime, dust, mud and dirt from surfaces and objects. Adjustable spray from fine to intense. Compact design with 2 axle mounted wheels allows easy roll-away mobility and user convenience. Pistol style grip with trigger spray wand dispenses efficient pressure washing with built-in holster for storage. Air cooled industrial motor. Includes pressure hose, soap dispenser, brass hose connector and GFCI-protected power cord. PSI ranges from 1300-2030. GPM ranges from <>1.3 - 2.3. HP ranges from 1/3-3.2. Built-in cord wrap on handle on some models. Voltages and cord lengths vary per style. Mobile Pressure Washers have electric pressure to provide a powerful stream of water designed to remove dirt and grime from outside buildings. Powder coated steel construction provides long lasting durability. Some models include lifting eye and forklift slots for easy loading. Gallons per minute range from 1.35 -5. PSI ranges from 1000-5000. Several models avaialbe. HP and Voltage vary per model. CP5216 is ETL approved to UL and CSA standards. Stationary Pressure Washers Are Used For Industrial Or Commercial Kitchens And Wash Bays. Stationary Pressure Washers are housed in a powder coated steel cabinet to provide long lasting durability. 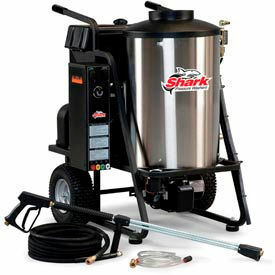 Electric-powered cabinet cold water pressure washers accepts hot water up to 180 degrees Fahrenheit. Belt-drive crankcase pump provides use for outdoor grounds maintenance. Magnetic starters provide operator safety. 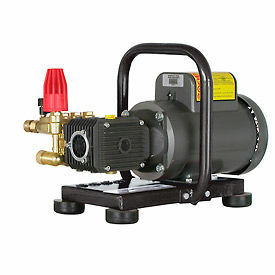 Pump styles include General, Triplex, Comet, comet Axial and more. PSI ranges from 1000-3000.<.b> GPMs range from 1.6 - 4.2. HP ranges from 1.5 - 7.7. Voltages are 110 - 575. 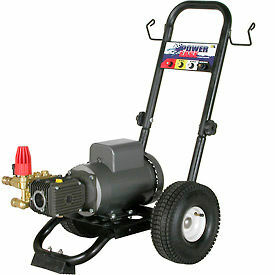 Hot Water Pressure Washers Are Used For Industrial Or Commercial Outdoor Pressure Washing Applications. Hot Water Pressure Washers are made of stainless steel coil wrap and all metal frame to provide long lasting durability. Belt-drive crankcase pump provides convenience. Handtruck design and water-resistant control box provide additional structural integrity. Schedule 80 heating coil for added user convenience. Portable. Available styles include General, Triplex, Ek, Karcher and more. PSI ranges from 1000-3000.<.b> GPMs range from 1.75 -8. Available drives are Belt or Direct. HP ranges from 1.5 - 15. Voltages are 110 - 575.